Grafted tree. 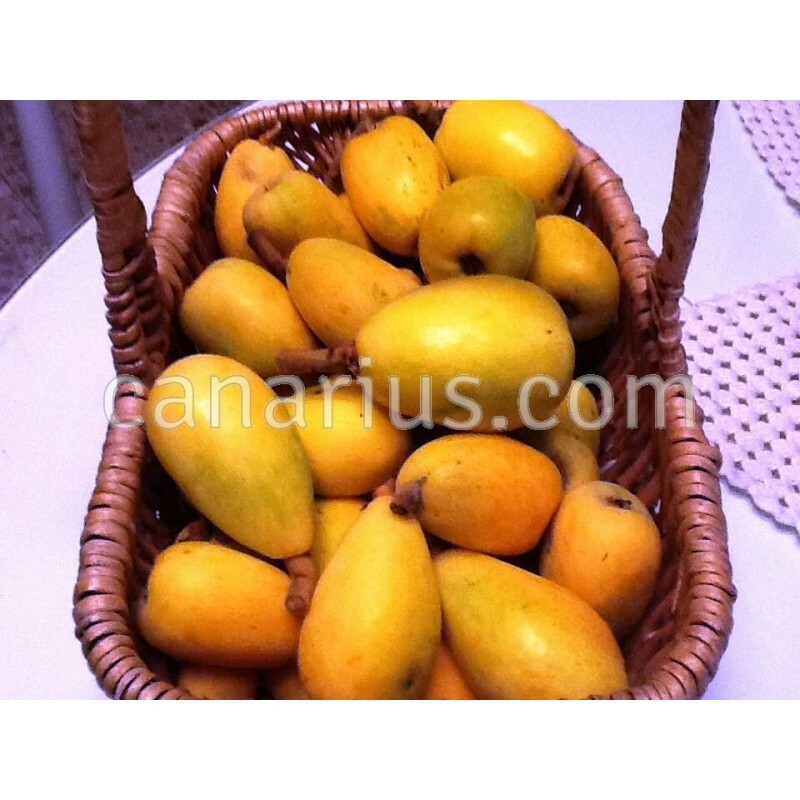 Spanish cultivar with very large, smooth, juicy fruits of "Japanese loquat", with a pale colour. The perfect fruit tree for the home garden, with sweet and acid fruits and very ornamental foliage. Fully hardy to about -7 C but also survives to about -17 C.
Spanish cultivar with very large, smooth fruits of "Japanese loquat". The variety "Peluche" is from SE Spain, where commercial plantations have flourished during recent decades. Peluche originated as a seedling or mutation of cv. Algerie. Peluche is a regular producer of large smooth yellow pale fruits, juicy with sweet, slightly acid flavour. The tree shape is perfect: robust, with a low spreading crown. Eryobotrya japonica is an evergreen tree native to the southeast of China. It is the perfect fruit tree for the home garden, now widespread in the Mediterranean. It is a popular sweet and acid fruits , but the tree is also highly ornamental, because of the ornamental foliage. 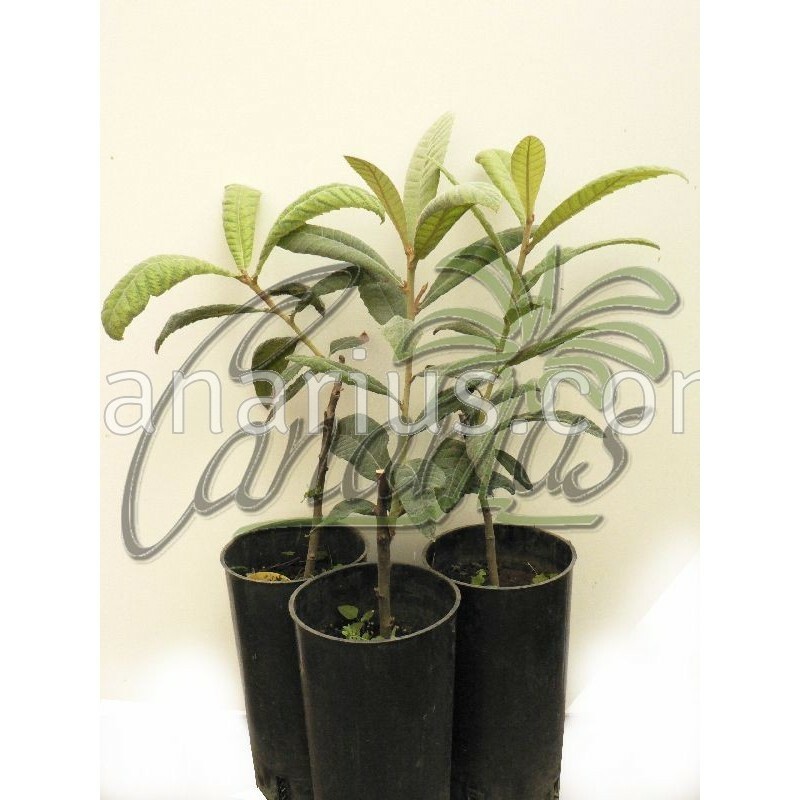 The small tree or bush has a round top and a short trunk with grey and chapped bark. It reaches up to 5-10 m, but it is often kept shorter 3-4 m. Leaves are very beautiful, leathery, with serrated margins, 20-30 cm long, dark green in the front and hairy in the back, especially when young. This species is unusual among fruit trees because it blooms in autumn or early winter, and fruits rip during the winter or early spring. Flowers are small, white, of about 2 cm. Fruits bear in group, 3-8(-12) cm in length, with a smooth or hairy skin, yellow, orange or reddish, often in Spring. Flesh is succulent, white, yellow or orange, sweet or acid depending on the cultivar. Usually eaten fresh or in fruit salads, jelly, sweets, chutney and syrup. It is easy to grow, adaptable and resistant to cold weather, dryness and diverse soil types. Often used as an ornamental. This species is frost tolerant to -5ºC to -8 C and will survive temperatures of -12ºC to -17ºC. We ship to your home a a grafted, potted plant. Usually between 50 and 80 cm in height.